Here's my transaction history with my coin wallet since I made my bitcoin wallet. Load any Globe, Smart, TNT, TM or Sun mobile prepaid number. 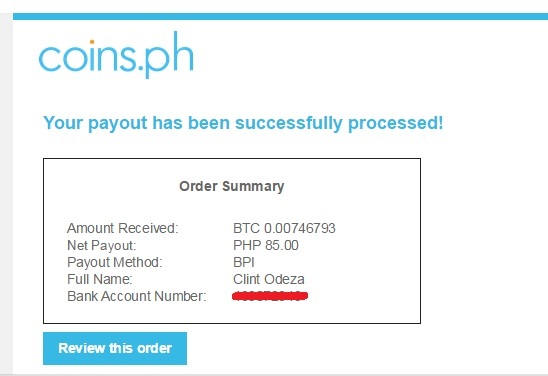 Receive rebates straight to your Coins.ph wallet in PHP. *Forgot to take the screenshot when I bought prepaid load but I guarantee that the transaction is very fast. On ‘Add Money’, select BPI Online Banking via DragonPay. Enter the amount you want to cash in and click on ‘Pay with DragonPay’. Initiate payment via BPI online fund transfer. Validate your payment with DragonPay by inputting the last 6-digits of the reference number. Receive funds to your Coins.ph wallet in 10 minutes or less!